Talk About Caregiving for a Chance to Win a Caregiver Package (~$100 in Value)! Caregiving takes many forms and shapes. Even if you do not identify as a caregiver, it is likely that you are caring for loved ones in your life. Even though our Caregiver Conference is over, we know caregiving never stops, so let’s continue the conversation! During the month of April, we will be sharing three different prompts about caregiving on our Facebook page. We encourage you to engage with us on Facebook for a chance to win a caregiver package! For further detailed information about this contest, refer to the official rules at the bottom of this page. Either you or your loved one you care for (or both) must be living in Los Angeles, Orange, or Ventura County in Southern California. The duration of this contest will run from April 1, 2019 12:00 a.m. PT until 11:59 p.m. PT April 29, 2019. You MUST follow all directions described here for each prompt to be counted into the Contest. Participant will post a picture of depicting what caregiving means to them, and write a caption explaining their picture, and tag Keiro (@KeiroConnect). The post must be set for public for Keiro to keep track. Any post after the stated period will not be considered an entry. One post will be counted as one entry into the Contest. The maximum number of entries per person for this prompt is two (2). Participant will comment on a prompt posted on Keiro’s page (facebook.com/KeiroConnect). Any comment after the stated period will not be considered an entry. One comment will be counted as one entry into the Contest. The maximum number of entries per person for this prompt is one (1), though participants may comment as many times as they would like. On or about 10:00 a.m. PT on April 30, 2019, Keiro, in its sole discretion will select one (1) Grand prize winner, one (1) Second Prize, and one (1) Third Prize in a random drawing from all valid entries received by Keiro during the Contest Period. The winning entrant will be contacted using the Facebook Messenger application to notify him/her of the prize (subject to verification of eligibility and compliance within the terms of the Official Rules). Winner should respond within seven (7) days of receiving this message on Facebook Messenger. Keiro’s decision regarding the administration and operation of the Contest and selection of the potential winners are final and binding in all matters related to the Contest. You MUST follow all Contest Rules; failure to do so will result in disqualification from the drawing. Each person must use their own valid Facebook account. All comments and posts must be relevant to the prompt given. Keiro has the right to determine this at their own discretion and delete or void any unrelated comments/posts at any time, and remove that participant from the Contest. All entrants agree to the below “Official Rules” upon participating in this contest. This promotion is in no way sponsored, endorsed, or administered by, or associated with, Facebook. No purchase or payment of any kind is necessary to enter or win. A purchase will not increase your chances of winning. Void where prohibited. Eligibility: This contest is open only to legal U.S. residents age eighteen (18) or older at the time of entry with a valid social security number and either you or your loved one resides within Keiro’s three service areas: Orange County, Los Angeles County, and Ventura County in Southern California. Any employees of Keiro and their immediate family members may participate in the posting, but are not eligible to for entry into the Contest. Immediate family members are defined as spouses, parents and step-parents, siblings and step-siblings, and children and step-children. The Contest is subject to all applicable federal, state, and local laws and regulations. Winning a prize is contingent upon fulfilling all requirements set forth herein. By participating in this Contest, entrants agree to be bound by these Official Rules and by the decisions of Keiro in all matters relating to the Contest. Contest Period: The duration of this contest will be held beginning April 1, 2019 12:00 a.m. PT and ending April 29, 2019 at 11:59 p.m. PT (“Contest Period”). Keiro’s office computer is the official time keeping device for this Contest. How to Enter: No purchase and no entry fee, payment, or proof of purchase is necessary to participate. You MUST follow all directions described here for each prompt to be counted into the Contest. 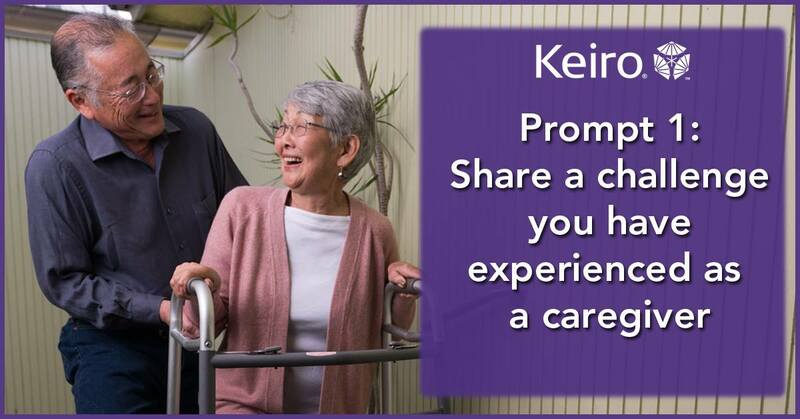 (i) For Prompt 1 (Valid from April 1, 2019 12:00 a.m. PT until April 13, 2019 11:59 p.m. PT), participant will post a picture depicting what caregiving means to them, and write a caption explaining their picture, and tag Keiro (@KeiroConnect) and post. Any post after the valid period will not be considered an entry. One post will be counted as one entry into the Contest. The maximum number of entries per person for this prompt is two (2). (ii) For Prompt 2 (Valid from April 14, 2019 12:00 a.m. PT until April 20, 2019 11:59 p.m. PT), participant will comment on a prompt posted on Keiro’s page (facebook.com/KeiroConnect). Any post after the valid period will not be considered an entry. One comment will be counted as one entry into the Contest. The maximum number of entries per person for this prompt is one (1), though participants may comment as many times as they would like. (iii) For Prompt 3 (Valid from April 21, 2019 12:00 a.m. PT until April 29, 2019 11:59 p.m. PT) participant will comment on a prompt posted on Keiro’s page (facebook.com/KeiroConnect). Any post after the valid period will not be considered an entry. One comment will be counted as one entry into the Contest. The maximum number of entries per person for this prompt is one (1), though participants may comment as many times as they would like. Each individual may only enter through their own Facebook account. You cannot copy and paste others’ posts and make them your own. If Keiro finds the post to be a copy of another person’s post, we will take your post down, and you will not be eligible to enter the Contest. Content also should not: contain any material that is inappropriate, indecent, lewd, pornographic, obscene, hateful, tortious, defamatory, slanderous or libelous, as determined by Keiro in its sole discretion, or contain any material that is unlawful, in violation of or contrary to the laws or regulations in any jurisdiction where entry is created. This promotion is in no way sponsored, endorsed, or administered by, or associated with, Facebook. Keiro is not responsible for any entries taken down or blocked by Facebook. Should a photograph be removed or blocked by Facebook, then the entry will be deemed not entered for purposes of this Contest. You agree to release Facebook from all claims arising out of, or in connection with, this Contest. Any questions, comments, or complaints regarding this contest should be directed to Keiro and not to Facebook. Winner Selection and Notification: On or about 10:00 a.m. PT on April 30, 2019, Keiro, in its sole discretion will select one (1) Grand prize winner, one (1) Second Prize winner, and one (1) Third Prize winner in a random drawing from all valid entries received by Keiro during the Contest Period. The winning contestants will be contacted using the Facebook messenger application to notify him/her of the prize (subject to verification of eligibility and compliance within the terms of the Official Rules). Keiro’s decision regarding the administration and operation of the Contest and selection of the potential winners are final and binding in all matters related to the Contest. Verification of Potential Winners: The potential contest winners are subject to verification by Keiro whose decisions are final and binding in all matters related to the Contest. The potential winners must continue to comply with all Official Rules set here and winning is contingent upon fulfilling all requirements. If a winner (i) is determined to be ineligible, (ii) fails to respond to the initial verification message within seven (7) days of notification, or (iii) fails to provide a valid e-mail address within seven (7) days of notification regarding prize winning, the winner forfeits the prize in its entirety and an alternate winner will be selected by random drawing by a Keiro staff from among all remaining eligible entries. Prize: The Grand Prize winner receives a caregiver package of about $100 in value including 1 caregiver transportation support prize, 1 caregiver food support item prize, 2 caregiving gadgets, and 2 caregiving support Books. The second prize winner is awarded a caregiver transportation support prize ($30 in value), and the third prize winner is awarded a caregiver food support prize ($30 in value). The prizes are non-transferable and no prize substitution is permitted, except at the sole discretion of Keiro. If a prize cannot be awarded for any reason, Keiro reserves the right in its sole discretion to substitute a prize with one of comparable or greater value. The winner is solely responsible for all federal, state, local, or other applicable taxes associated with the acceptance and use of a prize. All costs and expenses associated with prize acceptance and use not specifically provided herein are the responsibility of the winner. The award of the prize is conditioned on the Keiro’s satisfactory verification of the winner’s eligibility, including verification of age and residency. Publicity: Except where prohibited, participation in the Contest constitutes winner’s consent to Keiro’s and its agents’ use of winner’s name, likeness, photograph, voice, opinions and/or hometown and state for promotional purposes in any media, worldwide, without further payment or consideration, unless otherwise prohibited by law. General Conditions: By entering, each participant agrees to: (a) comply with and be bound by these rules and regulations, which are binding and final in all matters relating to this Contest; (b) release and hold harmless Keiro, the prize suppliers and any other organizations responsible for sponsoring, fulfilling, administering, advertising or promoting the Contest, and each of their respective past and present officers, directors, employees, agents and representatives (collectively, the “Released Parties”) from and against any and all claims, expenses, and liability, including but not limited to negligence and damages of any kind to persons and property, invasion of privacy (under appropriation, intrusion, public disclosure of private facts, false light in the public eye or other legal theory), defamation, slander, libel, violation of right of publicity, infringement of trademark, copyright or other intellectual property rights, property damage, or death or personal injury arising out of or relating to a participant’s entry, creation of an entry or submission of an entry, participation in the Contest, acceptance or use or misuse of prize (including any travel or activity related thereto) and/or the broadcast, exploitation or use of entry; (c) guarantee I am the true and rightful owner of photos posted for prompts (“Photo”) and I have the full right and authority to enter this Contest in favor of the Released Parties; (d) I, by signing this Release, agree to give to the Released Parties and its licensees, successors, and assigns a non-exclusive, worldwide and perpetual license to use, re-use, broadcast, and publish the Photo, as well as my name, biographical and other information in whole or in part, for any reason that the Released Parties deem necessary without compensation, including for advertising, promotional, and related purposes in connection with the activities or promotion of the Contest, unless prohibited by law. I agree to release, discharge, and hold the Released Parties harmless from any and all claims I may have against the Released Parties in connection with the use of the Photo my name, and/or city of residence, in whole or in part and without restrictions as to any changes, transformations or alterations; and (e) indemnify, defend and hold harmless the Released Parties from and against any and all claims, expenses, and liabilities (including reasonable attorneys’ fees) arising out of or relating to an entrant’s participation in the Contest and/or entrant’s acceptance, use, non-use or misuse of the prize. By entering, each participant further agrees to receive marketing communications from Keiro via any medium, known and unknown. General Conditions: Keiro reserves the right to cancel, suspend and/or modify the Contest, or any part of it, if any fraud, technical failures or any other factor beyond Keiro’s reasonable control impairs the integrity or proper functioning of the Contest, as determined by Keiro in its sole discretion. Keiro reserves the right in its sole discretion to disqualify any individual it finds to be tampering with the entry process or the operation of the Contest or to be acting in violation of these rules and regulations or any other promotion or in an unsportsmanlike or disruptive manner. Any attempt by any person to deliberately undermine the legitimate operation of the Contest may be a violation of criminal and civil law, and, should such an attempt be made, Keiro reserves the right to seek damages from any such person to the fullest extent permitted by law. Keiro’s failure to enforce any term of these rules and regulations shall not constitute a waiver of that provision. Limitations of Liability: By participating in the Contest, the Released Parties are not responsible for: (i) any incorrect or inaccurate information, whether caused by entrants, printing errors or by any of the equipment or programming associated with or utilized in the Contest; (ii) technical failures of any kind, including but not limited to malfunctions, interruptions, or disconnections in phone lines or network hardware or software; (iii) unauthorized human intervention in any part of the entry process or the Contest; (iv) technical or human error which may occur in the administration of the Contest or the processing of entries; or (v) any injury or damage to persons or property which may be caused, directly or indirectly, in whole or in part, from entrant’s participation in the Contest or receipt or use, non-use or misuse of any prize. If for any reason an entrant’s entry is confirmed to have been erroneously deleted, lost, or otherwise destroyed or corrupted, entrant’s sole remedy is another entry in the Contest, provided that if it is not possible to award another entry due to discontinuance or completion of the Contest, or any part of it, for any reason, Keiro, at its discretion, may elect to hold a random drawing from among all eligible entries received up to the date of discontinuance for any or all of the prizes offered herein. No more than the stated number of prizes will be awarded. In the event that programming or any other reason causes more than stated number of prizes as set forth in these rules and regulations to be available or claimed, Keiro reserves the right to award only the stated number of prizes by a random drawing among all legitimate, unawarded, eligible prize claims. Privacy: Any personally identifiable information collected during an entrant’s participation in the Contest will be collected and used by Keiro and its designees for the proper administration and fulfillment of the Contest and as otherwise described in these Official Rules. Governing Law and Jurisdiction: All issues and questions concerning the construction, validity, interpretation and enforceability of these Official Rules, your rights and obligations, or the rights and obligations of Keiro in connection with the Contest, shall be governed by, and construed in accordance with, the laws of State of California, without giving effect to any choice of law or conflict of law rules. By entering, you consent to the jurisdiction and venue of the state and local courts located in Los Angeles County, California and the federal courts located in the Central District of California for the resolution of all disputes, and agree that any and all disputes shall be resolved exclusively in those courts. Keiro’s failure to enforce any term of these Official Rules shall not constitute a waiver of that or any other provision. If any provision of these Official Rules is held to be invalid or unenforceable, such provision shall be struck, and the remaining provisions shall be enforced. Keiro is not responsible for any incorrect or inaccurate information entered by website users, and assumes no responsibility for any error, omission, interruption, deletion, defect, delay in operation or transmission, communications line failure, theft or destruction, or unauthorized access to Keiro’s website.